To make a simple cape like the one I wore yesterday, you need a nice fabric, not too thin, a lining that goes with it and two closures (Chinese Frog, buckles or other). Cut a rectangle 55 cm wide and 135 cm long. Line it with a silky fabric of the same size. Fold the fabric in the lengthwise direction like this. Stitch at 1 mm from the edge along the basting stitch and fasten the closures. Now you’re pretty with your cape. You can throw it over your shoulders and play the star. Well worth the two hours you just spent, right? 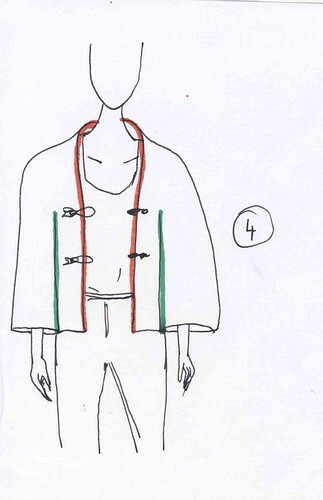 This entry was posted in Patterns and tagged cape, pattern.